Apologies for the late review of Rock Lee this week, time has been lacking a bit recently for reviews. In any case, better late than never! This is the 3rd week of the Rock Lee spinoff Anime, and I am happy to say it has been getting better and better each week. While unfortunately the second half of this week’s offering was only average, the first half / story was actually really funny. If they only made it an 11 minute episode per week, it truly would turn out amazing most likely. The first story was all about Rock Lee’s rivalry with Neji. Of course as fans of the original Naruto series will know, they have had a long rivalry and Lee has always come up short in his efforts to beat the genius Neji. In this episode Lee gets annoyed by how everyone talks about how amazing and cool Neji is, while he gets no attention himself. 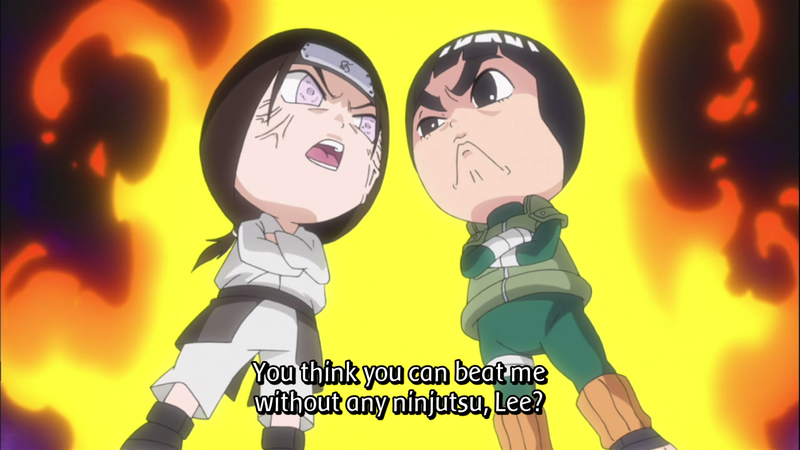 Lee gets annoyed to the point where he eventually challenges Neji to a fight in one weeks’ time, which Neji accepts. The episode consists of Lee trying to get stronger in the space of a week so that he can beat Neji, and it’s pretty hilarious. Before his challenge with Neji even came about, initially Lee was just seeing Neji and comparing himself to his standards (and Naruto was soon involved with helping Lee once he saw Sakura was also impressed by Neji). One of the things Lee does is tell TenTen that he also has Byakugan, so he lowers his head and closes his eyes, and when he looks back up at her he has tape on his eyelids that makes him look really silly, shocking TenTen who thinks Lee is being an idiot. When Naruto first sees Lee looking that way, he doesn’t even recognise who it is, as TenTen can’t believe anyone could be so dense. The really funny parts were a bit later, including Lee saying he was even less of a man than Neji since he wore briefs while Neji wore boxers. And shortly after that, Lee, Naruto and Neji were all using some urinals, and Lee and Naruto come out and sit hunched over acting depressed. They then bemoan the fact that they are smaller than Neji, and “that it’s just one more gift god has bestowed upon him”! I swear I am not kidding, they actually did that and it was hilarious. There were just plenty of really funny moments like that in the episode, and there are of course more moments that I haven’t mentioned which are almost if not just as funny that you can see for yourself if you watch it. The second half is about TenTen trying to get Lee and Neji to act more like gentlemen around her, as currently they kept doing things like stripping down to their underwear in front of her and letting her fight the enemies by herself instead of protecting her. TenTen gets angry and whacks them both a few times throughout the episode as they misunderstand what she means about acting more like gentlemen, and there are a few humourus moments where Lee and Neji go over the top in trying to change their ways, including basically waiting hand and foot on TenTen for a while and wearing fancy white suits. After numerous failed attempts, Lee and Neji realise things aren’t working, so instead they dress TenTen up as a boy saying things will be easier that way. TenTen first of all agrees before she realises what she’s saying, and then of course ends up whacking them both again and calling them idiots. In the end it just ends up with TenTen realising that she doesn’t want or need any special attention just because she’s a girl, and that she was happy with things the way they were before. As I said, the first half was really good, I found myself laughing throughout the whole episode. Sure it’s pretty immature stuff most of the time, but who cares? This Anime is supposed to be silly like that to get laughs, and anyone who is watching expecting anything different are just deluding themselves. As long as a comedy series is funny, I for one don’t care how it makes me laugh, as long as it does make me laugh, which Rock Lee does. The second half was pretty average though. While there were a few laughs, they were pretty few and far between sadly. So far Rock Lee seems to always be like that, with one half standing out as much better than the other, and that’s what leads me to believe that maybe it would have been better as an 11 minute episode per week rather than splitting it up in to two stories. That said, since the show has been steadily improving each week, I do have faith that a bit further down the line we may start seeing the whole 22/23 minutes become entertaining. Rock Lee has really impressed me, as I will admit I wasn’t expecting much from the series to begin with, but it is a really fun show to watch and gives me a good laugh most of the time. Rock Lee’s Anime has really been growing on me, and I can see myself beginning to look forward to it more and more each week. Hopefully this trend can continue, and if it does, then it will certainly be a series I will recommend to someone who is looking for a good comedy.